Youths in Singapore are spending more time online now than ever. The average number of hours youths in the country spend online daily has gone up from 4.8 hours in 2011 to 5.5 hours last year, a study by Singapore Polytechnic found. Results of the annual study, conducted in June last year, were based on person-administered surveys with 820 youths, defined as those aged between 15 and 35 years old. 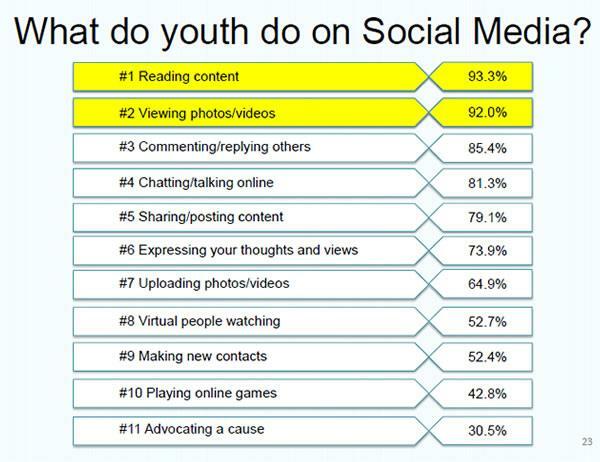 The top five activities online include reading online content, viewing photos and videos, commenting and replying others, chatting online and sharing or posting content. The study also found that the youths with high levels of well-being spend less time online daily at 5.4 hours compared to people who have low levels of well-being at 6 hours. Well-being, in this study, is measured through health, social life, education and job opportunities, freedom of expression, level of human rights, personal safety and sense of belonging. About 86 per cent of respondents ranked high on level of well-being, while about 14 per cent of respondents ranked low. Respondents were also asked to rate their level of happiness, with the majority of respondents (85 per cent) rating themselves to be generally somewhat happy. Happy respondents were also found to have spent less time online, clocking an average of 5.4 hours while unhappy respondents clocked an average of 5.8 hours daily. The study also showed that youths prefer to communicate on social media with their friends and face-to-face with their family members. Younger respondents spend more time online as compared to the older respondents. However, there is a small percentage of youth who do not communicate face-to face at all with people around them. 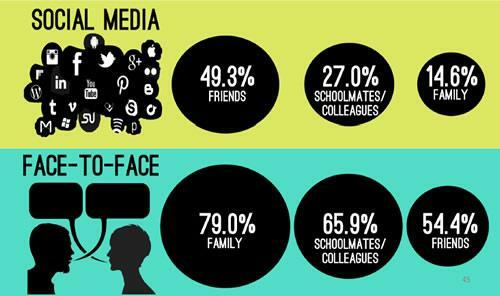 5.2 per cent or about 42 respondents said they do not communicate in person with their schoolmates or colleagues on a daily basis. 3 per cent and 1.7 per cent of respondents said the same about their family and friends respectively. “Personally, the most surprising thing from this survey is that there are actually people who do not communicate with their family, friends or schoolmates,” said 18-year-old Rachael Wong, who worked on the study with her schoolmates. We see friends and family every day and there are still people who don’t communicate with them face to face, it doesn’t make sense, Wong added.